The segment -- with some excellent questions from fellow Mainers calling in -- is now also available for online listening at this link. Thanks again to Maine Public for having me on. My next public talk in Maine is at the Colloquy Downeast in Blue Hill September 16 (on Lobster Coast themes). This is the 300th anniversary of the coming of the Scots-Irish to New England and to mark the occasion, there's a multi-day conference taking place this week at Bowdoin College sponsored by the Maine Ulster Scots Project. The 2018 Diaspora Conference and Reunion opens tomorrow morning, August 14 at Bowdoin's Kresge Hall and continues through Thursday, with presentations from scholars on both sides of the Atlantic. 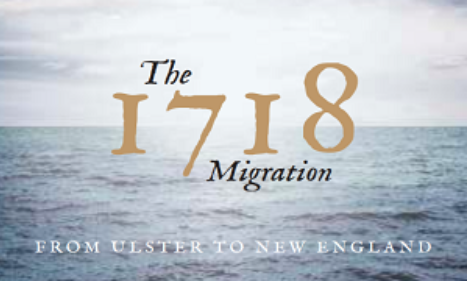 I'm pleased to be giving the opening keynote Tuesday night on the impact of the Scots-Irish migration on both Maine and North America, issues I wrote about in some detail in The Lobster Coast: Rebels, Rusticators, and the Struggle for a Forgotten Frontier and American Nations: A History of the Eleven Rival Regional Cultures of North America respectively. I'm preceded by Norman Houston, director of the Northern Ireland Bureau, the diplomatic mission of that part of the UK to the US and Canada. Conference information can be found here. At 1 pm tomorrow I'm also speaking about the political ramifications of American Nations in Maine Public radio's live interview and call-in program, "Maine Calling." Tune in if you can. Is Pittsburgh in the Midlands? As for Columbus, I've heard both pro and con arguments from readers there for its Appalachian designation, but nothing from the city's intelligentsia. Let's hope they weigh in one of these days -- the Cleveland Plain Dealer did in regards to the Western Reserve's Yankee character in comparison with southern Ohio's Appalachian one -- but not a word from the Dispatch. With a Supreme Court nomination struggle looming, all eyes remain on Republican Senate centrists Susan Collins of Maine and Lisa Murkowski of Alaska. Last CSPAN's Washington Journal about Collins' position on Roe v Wade and the nomination, and what outside legal experts have to say about it. You can find the clip here. I last appeared on CSPAN last summer, talking about American Character and The Lobster Coast with their mobile crew on their visit to the Portland, Maine area. Previously, they broadcast my full American Nations talk at Iowa State.